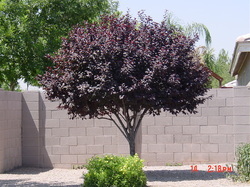 There are two considerations when pruning plum trees. The first is to establish a good shape. The second is to avoid any infection with silver leaf disease. The key to avoiding this infection is to prune plum trees at the correct time of year To avoid silver leaf disease, prune plum trees in June when they are growing strongly, do not prune in the winter. Try to make the pruning cuts as cleanly as possible, and avoid crushing the wood. If any larger sections of branch are to be pruned, seal the cut with a protective sealer available from garden centres. Burn any diseased or dead wood. New Video I found with an excellent demonstration on pruning a 5 year old plum tree. Remember: structure trumps production at this age..
What is it ? Silverleaf (Chondrostereum purpureum) is a fungal disease that attacks deciduous trees and shrubs The fungus can easily move between the different host plants. For example, silverleaf on peach trees can also infect apple trees. What does it look like ? The characteristic symptom of silverleaf is a silvery sheen on the foliage. The fungal toxins, and/or enzymes in the sap stream, damage the leaf cells. Light reflects through these damaged cells giving a silvery effect. Leaves over the whole tree may be silvered if the fungus enters through a large wound in the trunk. Entry through a smaller wound may produce symptoms on just one branch. What is the life cycle ? Bracket-like silverleaf fruiting bodies form on dead wood. The fruiting bodes produce spores which are carried by wind and enter wounds of susceptible plants. If conditions are right, infection will take place. In some cases, the fungus will continue to spread and eventually kill the host. What conditions are needed ? Drizzly, rainy, foggy or humid days with no wind or sun - in other words days on which the household washing won't dry - are perfect for silverleaf spore release and infection. Quick video that starts with pruning a plum tree. Notice the tree is 15 years old and pruned to maintain a height of less than 6 feet. First year: Wisp or single stem bare root tree. Prune in June to avoid the risk of silver leaf disease. In the second year's pruning, cut back the main stem by about 45cm (18 in), just above a bud (point A). Below this cut, there should be three or four buds above the branches from last year. Prune all the remaining branches so that they are about 25cm (10in) long. The cut should be immediately above a healthy looking bud. Prune in June to avoid the risk of silver leaf disease. In the third year's pruning, again cut back the main stem by about 45cm (18 in), just above a bud (point A). Below this cut, there should be three or four buds above the branches from last year. Prune the branches which have grown this year so that they are about 25cm (10in) long (points B). The cut should be immediately above a healthy looking bud.